Cider vinegar is a pharmacy on its own. This fermented apple cider is rich in minerals, including potassium, chlorine, calcium, sulfur, iron, fluorine. It is too rich in vitamins, amino acids, and micronutrients. Antibacterial thanks to its acidity, it can cure the little ailments of everyday life. Cider vinegar, like all others, is composed of 95% water. It is very low in calories, barely two per tablespoon. Thanks to its enzymes, it can facilitate digestion because it digested the proteins and facilitated the degradation of fats. Dr. Carol Johnson, deputy director of the University of Arizona Nutrition program, details the biological capabilities of the cider vinegar in the New York Times: “Vinegar absorbs starches and releases some in the form of fibers.” And this makes it possible to slow the arrival of the craving for nibbling. The cider vinegar also renews the intestinal flora and can relieve some digestive disorders, such as constipation and flatulence. How to use it? It is better not to drink pure cider vinegar, but to dilute it with water, honey or tea. Otherwise, it can damage the enamel of the teeth and mucous membranes of the mouth. Thirty minutes before the meal, drink a small glass of lukewarm water with a teaspoon of cider vinegar and another of honey. Caution, However, this use of cider vinegar is not recommended for people suffering from severe ulcer, gastritis or gastroesophageal reflux. It is an American study of 2004, published in the journal Diabetes Care, which demonstrates the positive influence of cider vinegar on blood glucose, the rate of glucose in the bloodstream. The subjects of this study, type 2 diabetics, consumed a solution based on cider vinegar before eating a meal rich in glucose. After the meal, blood glucose increased less with cider vinegar. The subjects noted an improvement of 19% with this solution. How to use it? 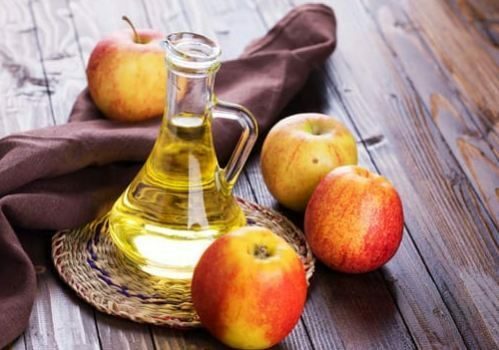 In no case should cider vinegar Replace the treatment of diabetes? But it can complement it, be a plus . Before meals, drink a mixture of 25 ml of cider vinegar, added to 40 ml of water and a teaspoon of saccharin (an artificial sweetener). The ph of the cider vinegar is very similar to that of the skin. It can soothe irritations due to insect bites. How to use it? Apply directly to the sting or if the skin is sensitive, first dilute the vinegar in water before applying it to the skin. Cider vinegar is an antibacterial. It removes the bacteria responsible for bad breath and freshens the mouth. How to use it? Be careful not to swallow the product. Mix two tablespoons of cider vinegar in a glass of water. Make gargles with this solution until the glass is empty. It is still thanks to its antiseptic power that cider vinegar can help to get rid of it. How to use it? Against a sore throat, use cider vinegar in gargle with four teaspoons of cider vinegar diluted in a large glass of hot water. To be repeated in the day. For a cold, prepare a solution consisting of two tablespoons of honey and 80 ml of cider vinegar. Drink a tablespoon several times a day. Cider vinegar can also be used in inhalation. In a large bowl of boiling water, dilute two to three tablespoons of cider vinegar. Cover the head above the bowl with a cloth and breathe in the vapors. With its ph close to that of the skin, the cider vinegar can help to regulate it. Thus, the bacteria responsible for the bad odors will be eliminated. How to use it? Rub the armpits with a cotton soaked in cider vinegar. For the feet, bath by filling a hot water basin and adding 80 ml of cider vinegar. Cover your feet in it for 15 minutes, once a week. It is advisable to favor the quality cider vinegar for these uses. The ideal is an unpasteurized organic cider vinegar, produced in an artisanal way. To note, cider vinegar must have aged for at least ten months in oak casks to contain the maximum of active substances. Do You Eat Pomegranate Seeds? Next post Side Effect – Are Effects of Chemo Cumulative?